I won't bore you with the excuses (although I have a few), bottom line is, I didn't adjust to the market's pace (or lack of), and got chopped. There just wasn't any follow through on the moves today; my trades would go 1-2 points in favor, but my targets were usually 3-4 points and I would try to be patient and hold out for target, and instead get hit with a loss since price would reverse hard! I had 25 trades today (32% win rate) with 3 Longs (all losers), and 22 shorts (36% win rate) and ended the day with a net loss of -$310 ($157.20 lost on the 3 Longs, and $152.80 lost on 22 shorts). At least I kept it tight. I made several mistakes. First mistake was trading while I was mentally frustrated and physically occupied with non-market related issues, and not "in the zone". 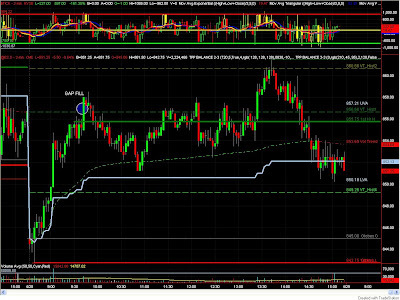 Second, I got sucked into trading the afternoon range-bound chop, and reversed my position several times which resulted in several small losses. I should have just waited it out, but I really thought the market was going to drop to at least the 851 area, and wanted to be positioned short into the drop. After I was down over $300, I decided to call it quits, and of course we got the break-down in ES right after I quit for the day (so frustrating!). And that brings me to an important question: Should I impose a loss-limit while I'm on the Sim? I would definitely have a loss limit on the real $ account, and it makes sense to treat the Sim trading as close to real $ trading as I possibly can. But on the other hand, I miss out on additional screen/trade time if I quit early in the day. Post your thoughts in the comments. 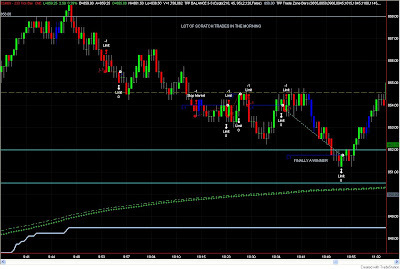 An update on my friend; he netted +$55 or so today after commission. Not bad at all considering the price action. GDP at 7:30 AM (central) and FOMC Meeting Announcement at 1:15 PM (central) tomorrow. If you stop trading for the day, the next trade (assuming it's a familiar setup) can be significant enough to recoupe your losses for the day. I think the books say you should and must trade EVERY setup you see to keep your statistical edge relevant. I'm too worried about capital preservation to do that, so as of now I have a mental loss limit. Anything above 10 points gets uncomfortable to me. Good points! I'll stick with the loss limit. Plus, I plan on switching to my Live account in the near future so might as well "keep it real"
Considering the price action you did fine man! I'm taking tomorrow off due to FOMC but just don't get caught in the crap before hand and you'll be just fine. I think it really depends on what your trading methodology/plan is. Some methods call for a series of entries to be made to get the odds on your side - in which case you will trade every setup you see (much like what MVW has mentioned), regardless of how you FEEL about the outcome of each entry. What's important here then is that you can afford the drawdown. Tuesday was tough for me too, but only because I let myself get psyched out on a loser after the 2:45 drop started. Letting myself get emotional about a loss (HaHa on me) caused me to miss a good short soon after that would have redeemed me plus more. It has always been my position that we have to "take" when the market is "giving", so I have no trade/loss limits per day EXCEPT when I feel mentally whipped (like Tuesday) where all I will do is cause myself harm by pushing. Getting the emotion out of trading is a big part of my effort now. It will never happen completely, but it can and should be cut way short. Jules, my max stop-loss is 2 points. 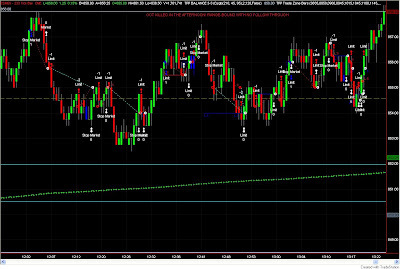 I wasn't around in the morning, so missed the early long setups.